After-school take on a classic: PB&J crumb cake. My strong preference is still for maximum crumb. 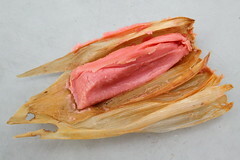 The bubblegum-bright color is typical of tamales dulces — sweet tamales — to readily distinguish them from their savory counterparts. More-elaborate versions can be filled with fruits or nuts. The masa in this basic sweet tamal ($1) might have been combined with the ready-mix for a Mexican dessert. I thought I detected a faint strawberry flavor, but maybe that was just the pink talking to me. Weekdays, early morning till lunchtime; weekends, "all day"
These twin flyers apparently advertise two home-based businesses, for day care and for frituras, at the same address; the phone numbers, redacted by me, are identical. 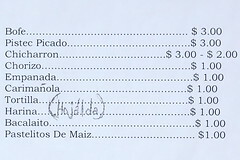 There's no mention of Panama by name, but a menu that includes carimañolas and hojáldas reminds me of brunch at Kelso. 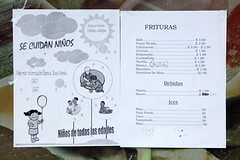 If these flyers had been posted in Jackson Heights, Panama's neighbor Colombia would be a better guess. Carimañolas and hojáldas are popular in both countries. 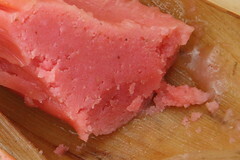 So is the first item on the list — bofe, or beef lung — which is near-impossible to find in New York, at least over the counter.